Winner of the Wanderlust Adventure Travel Book of the Year 2016. 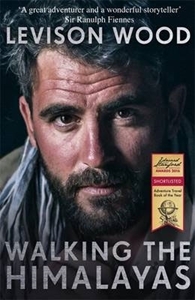 'Levison Wood is a great adventurer and a wonderful storyteller' Sir Ranulph Fiennes 'Britain's best-loved adventurer...he looks like a man who will stare danger in the face and soak up a lot of pain without complaint.' The Times Levison Wood's most challenging expedition yet begins along the Silk Road route of Afghanistan and travels through five countries. Following in the footsteps of the great explorers, Levison walks the entire length of the Himalayas in an adventure of survival and endurance. A personal story of discovery, Levison forges strong bonds with local guides, porters, mountain men, soldiers, farmers, smugglers and shepherds. By travelling on foot, and following the same footpaths that locals use, he uncovers stories that might otherwise remain hidden. Along the way he also reveals the history of the Himalayas and two millennia of exploration, and examines a continent in crisis in the 21st century. Packed with action and emotion, more than anything Walking the Himalayas is a story of personal adventure and striving beyond the limits of convention.